Obama Versus the "Fat Cats"
President Obama has ratcheted up his rhetoric against Wall Street just as some of the nation's top bankers head to the White House for what looks increasingly likely to be a tense and combative meeting. In an interview with "60 Minutes" correspondent Steve Kroft, the president went after what he called the "fat cat bankers on Wall Street." He said bankers have not shown "a lot of shame" about their behavior and outsized compensation despite the bank bailouts and economic downturn. After stating that the financial crisis was "caused in part by completely irresponsible actions on Wall Street," Mr. Obama suggested that some banks paid TARP bailout money back to the government specifically to free themselves from government-mandated constraints on executive compensation. "I think in some cases that was a motivation," said Mr. Obama. "Which I think tells me that the people on Wall Street still don't get it. They don't get it. They're still puzzled, why is it that people are mad at the banks?" "Well, let's see," continued the president. "You guys are drawing down $10, $20 million bonuses after America went through the worst economic year that it's gone through in decades, and you guys caused the problem. And we've got ten percent unemployment. Why do you think people might be a little frustrated?" He went on to say there is a Wall Street culture that feels "it's always making good decisions, and if it's not, then it's somebody else's fault." Mr. Obama, who is pushing a "targeted jobs package" to address the lagging employment rate, meets Monday with some of the very people who he seemed to be targeting in the interview. 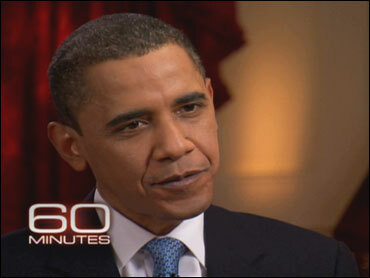 Obama: Gatecrashers Lapse "Won't Happen Again"
Web Extra: Why This War? Among those traveling to the White House for the meeting are Goldman Sachs' Lloyd Blankfein, JPMorgan Chase's Jamie Dimon and Bank of America's Ken Lewis. Bank of America repaid its $45 billion in TARP money just last week. The meeting could be awkward, to say the least. Even before the president channeled populist anger in the "60 Minutes" interview, a source close to a top bank C.E.O.s told CBSNews.com that the banker is feeling "buyer's remorse" about Mr. Obama, who, the source suggested, was unfairly demonizing Wall Street. On Friday, against the wishes of many on Wall Street, the House passed "the most ambitious restructuring of federal financial regulations since the New Deal." Mr. Obama immediately lauded the bill, which will have to be reconciled with a Senate version. Large banks have been lobbying against the legislation and broadly against efforts to increase regulation of Wall Street. Their efforts have come to the consternation of White House officials already upset with banks for what they see as an insufficient willingness to increase lending levels. "For them to be complaining about serious regulation directed at making sure this never happens again is wrong," White House economic adviser Larry Summers said on CNN Sunday. "For $300 million to be spent on lobbyists trying to gut serious efforts at financial reform is not how this country should be operating. For firms that have benefited from taxpayer support to be complaining about the government burdening them is, frankly, a bit rich." Still, Wall Street bankers don't seem to see Mr. Obama as someone who "proceeded to sell [Americans] out, instituting a massive, trickle-up bailout and systematically gutting regulatory reform from the inside," as Taibbi puts it. (Or, if they do, they're not saying so.) They seem to see him more as someone who is ginning up potentially-dangerous populist anger for political reasons, and who is pushing through regulations that will hamper their ability to drive the American economy. The president doesn't seem all that intent on changing their mind. "…unfortunately this is like the guy who has dynamite strapped around him and his finger on the button," Mr. Obama said on "60 Minutes" in reference to the unpopular decision to bail the banks out in the first place. "You know, you gotta kind of talk him down because all of us could go."